Just thought I would share some insight on a little "project" I just did. 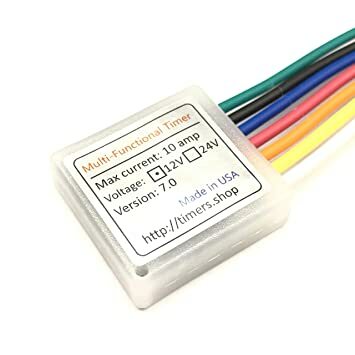 Ordered this mini timer delay relay from Amazon so I can delay the turn-on of the gauge/O2 sensor. Whenever I start the car, I can see condensation coming out of the downpour "muffler tip". Was told from someone that condensation can damage the O2 sensor since it heats up when power is applied to the gauge/sensor. The instructions for the relay can be a bit confusing but if you pay attention, it isn't as hard as people say. The wording is what confuses the installation process. For mine, I have it programmed to 1 minute after I turn on the ignition. If anyone is planning to use this relay and have a hard time programming it, feel free to hit me up. I am using the 10A version. It says "24V" but will work since it ranges from 6V ~ 28V DC. Will the "Delay After Engine Start" parameter in the Closed Loop menu on SManager (Hondata) do the same thing? Last edited by NVturbo; 02-12-2019 at 03:32 AM. How does it handle the car being warm already? A minute after ignition power up didn't affect anything on the gauge. It still shows "HEAT" on the gauge and reads fine once the delay is over. I just didn't want it to heat up while there was still condensation inside the DP. Let me guess. You burned that stupid AF 4.9 bosch? I killed mine within DAYS. Can you give us more derections r when to start on this? I was thinking about a button to turn it on after 1 minute but this is much better. haha...Nah. Mine is still working fine. While I was at the dyno shop, one of the guys mentioned I should install a switch to turn on power for the gauge/sensor. I didn't want to add a tacky switch. This is a cleaner look and you don't have to remember to turn on/off a switch for the gauge/sensor. Since my car doesn't have a full exhaust (and it's loud as ****), I have not been driving it. Having this 12VDC power supply helped me set up the timer relay. You can program it in the car but it's not as convenient. The following is what you need to worry about. I copy/pasted the instructions but added info underneath each step. 2. RED and ORANGE connects to power source, BLACK to ground and YELLOW to output. WHITE and GREEN are configuration wires.... used to configure the timer. Configuration wires can be connected to buttons for ease of programming, but it is not necessary, especially if the timer is going to be configured only once. 3. Select the appropriate timer function from Figure 2 for your project and note the function number. 4. Skip this step if trigger is not used. Select the appropriate timer trigger configuration function from Figure 5 and note the trigger number. 5. Go into the programming mode by connecting both (White and Green) to ground and then supply power to the timer. Disconnect WHITE and GREEN wires from the ground after 1 second. Power to the load will turn on for 3 seconds, indicating the timer entered programming mode. Timer is ready to be configured with time delay (t1) and (t2). 6. To program time delay (t1), short configuration wire (White) to the ground (or push button #1 if connected) and keep it connected to the ground for time required delay (t1), then release. Timer will supply power to the load when configuration wire is connected to the ground. To program time delay (t2) perform the same procedure with Green configuration wire. 7. Once time delay has been programmed move to the timer function and trigger configurations. Connect both configuration wires (White and Green) to the ground for 1 sec. Power to the load will turn on for 3 seconds. 8. To program timer function you need to know function number from Figure2. Use the configuration wire (White), short it to the ground and disconnect the number of times equal to the selected function number. If you connected button to configuration wires push button #1 the number of times equal to the selected function number. If you are unsure or need to repeat the steps, disconnect power from the timer and start with step 5. 9. If the trigger option is not used you can skip this step. To program timer trigger you need to know trigger configuration number Figure5. Use the configuration wire (Green), short it to the ground and disconnect the number of times equal to the selected trigger configuration number. If you connected button to configuration wires then push button #2 the number of times equal to the selected trigger number. If you are unsure or need to repeat the steps, disconnect power from the timer and start with step 5. 10. Once timer function and trigger has been programmed move to the timer output configuration. Connect both configuration wires (White and Green) to the ground for 1 sec. Power to the load will turn on for 3 seconds. 11. Connect and disconnect (White) configuration wire to the ground to configure normal output or use (Green) wire to select reversed output. Normal output is programmed from the factory. 12. Once timer output has been programmed move to the time programming mode configuration. Connect both configuration wires (White and Green) to the ground for 1 sec. Power to the load will turn on for 3 seconds. 13. Connect and disconnect (White) configuration wire to the ground to configure normal programming mode or use (Green) wire to set hours/minutes/seconds programming mode. 14. Disconnect power from the timer. Isolate configuration wires with tape (if buttons are not used) . Once you're done, you can test to see if your "test light" will come on, after the delay time you selected. Last edited by NVturbo; 02-13-2019 at 03:25 AM. Ill read and try it. I dont want to spend 80 euros on a sensr it will burn within days. The timer relay won't do any harm to the gauge/sensor. It just does one thing, delay the ignition 12VDC power for the component(s). Beats buying Bosch O2 sensors every so often.